Using Spotted Gum goes far beyond the environmental credentials and support for the local economy. This particular timber was specified for its durability, strength, density and appearance to suit the corrosive, coastal environment. Hyne Timber’s Glue Laminated Timber Business Development Manager – Commercial, Rob Mansell, said this project represents a perfect case study in support of early contractor involvement. “Innovative and unique designs using timber need the design team to come together with the timber manufacturers from the start as was the case with Mon Repos,” he said. “The architects presented us with their vision, at which point we can provide practical and logistical advice for the best way to achieve that vision, ensuring the timber is designed for manufacture and ease of construction. “It is important to apply capability to the design from the very beginning. This ensures delivery of the most cost efficient solution for our client, the Queensland Parks and Wildlife Service. Using prefabricated timber means installation is clean and quick, managed by just four construction workers on site. 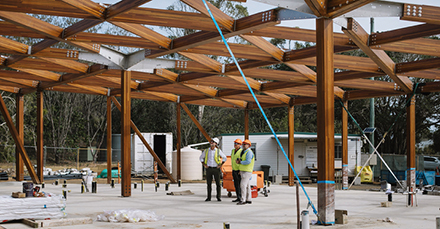 All the timber beams were manufactured by Hyne Timber at its GLT Plant in Maryborough, a site which is currently undergoing significant expansion with the support of the Queensland Government Jobs and Regional Growth Fund. The expansion will dramatically increase the availability of GLT for the construction industry. Architect, Richard Kirk said the whole brief for this centre focused on sustainability and environment. “Firstly, the location is behind established sand dunes which provide a natural shield between the building and the hatchings to conceal the possible spill of the buildings light. 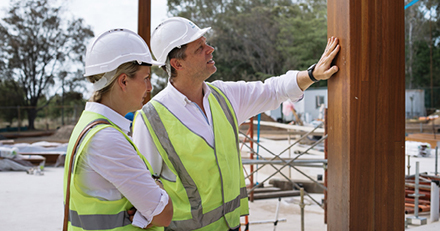 “The entire glue laminated timber structure is locally grown, certified Spotted Gum, not only meeting exceptional sustainability credentials, but from a practical perspective, allows large spans with no internal structural walls,” he said. “This means the interior can be readily, seasonally reconfigured to meet the educational and conservation needs of the centre and its year-round visitors. The largest concentration of marine turtles on the eastern Australian mainland choose Mon Repos as their nesting place. Mon Repos, meaning ‘my rest’ in French, is a conservation park near Bundaberg, Queensland where rangers and scientists manage conservation and research programs to enhance the success of nesting before hatchlings make their perilous journey to the sea some months later.